Papaya thrives well in tropical climate. . The occurrence of low temperature and frost limits its cultivation. The optimum temperature for the growth and development of papaya is 22-26°C. In Kerala, the limiting factors for commercial cultivation are high rainfall and severe drought in summer. However, this is best suited as a homestead fruit crop. The papaya prefers a rich, well drained soil. It will not tolerate water logging around the trunk. Washington, Honey Dew, Coorg Honey Dew, Solo, Pusa Dwarf Surya, Co-7, Pusa Nanha, Pusa Giant, Co-2 and Co-5 are suitable for papain extraction. 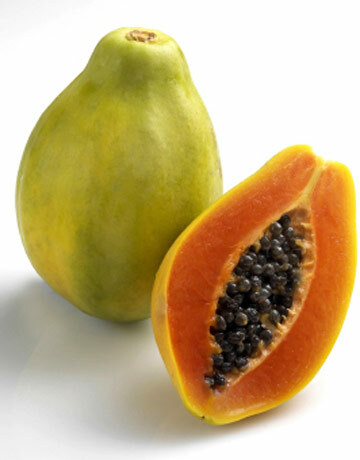 Papaya is propagated almost entirely by seeds. . The best time for raising papaya seedlings is from February to March. The seeds are sown in raised seedbeds of 2 x 1m made 15cm above the ground level or in polythene bags. A mixture of sand, leaf mould and dried FYM is spread over the seedbed. The seeds are sown 2-3 cm deep at a distance of 5cm in rows 15 cm apart. To raise seedlings for planting in a hectare, 250g seeds are required. Seedbeds should be watered daily, if there is no rain. Papaya seedlings raised in polythene bags can stand transplanting better than that raised in seedbeds. Polythene bags of 20 x 15cm size and 150 gauge thickness are used as containers. They are filled with a mixture of FYM, soil and sand in equal proportions. Two seeds are sown in each bag and after germination, only one seedling is retained. Vegetative propagation by mound layering is also possible. Two month old seedlings are transplanted in the main field in May-June at a spacing of 2 x 2 m. Pits of size 50 x 50 x 50cm are taken and filled with topsoil. Male plants are removed as soon as they flower and the female and hermaphrodite plants are retained. In pure female plantations, one male plant is retained for every 10 female plants. Seedlings are shaded to protect them from excessive sunlight until they establish. In hermaphrodite or monoecious types male plants may not be required. Organic manure may be applied at the rate of 10 to 25 kg / plant / year at the onset of southwest monsoon in basins around the plant. 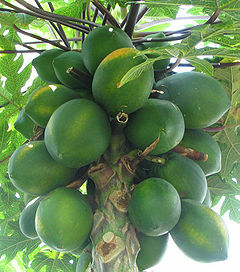 Each papaya plant should also be supplied with 40 g N, 40 g P2O5, and 80 g K2O at every two month interval. Keep the papaya plot free of weeds. Two hand-diggings, one in the beginning of the rainy season and another in January - February are necessary. When papaya is grown as the main crop, vegetables can be profitably cultivated as intercrop for about six months from planting of papaya seedlings. The crop should be irrigated in summer. The ring system of irrigation is better for papaya than the basin system because the ring system prevents irrigation water coming into contact with the stem, thus preventing collar rot. It causes rotting of seedlings in the nursery. This can be prevented by sterilizing the soil of the seedbed with 2.5% formaldehyde solution and covering it for 48 hours with newspapers or polythene sheets. This treatment is given 15 days before sowing. Water logging and bad drainage are the chief contributing factors. Application of Bordeaux paste on the stem and soil drenching with Bordeaux mixture are control measures. It causes premature fruit fall and leaf fall. To control, spray Bordeaux mixture 1%. Papaya mosaic and papaya leaf curl are two serious virus diseases of papaya. Remove the affected plants and burn them immediately. The seedlings flower and set fruit within 3-5 months after transplanting. The number of fruits harvested per tree per year varies from 25 to 30. Fruits showing streaks of yellow colour are harvested. Although papaya trees bear flowers and fruits continuously for many years, it is not economical to retain the trees after 2.5 to 3 yrs. 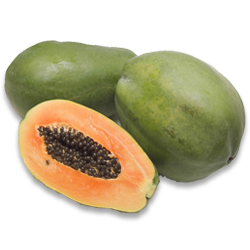 Papain is an active enzyme present in the latex or milky secretion of papaya plants and immature fruits. Half to three-fourth matured fruits (about 70 to 100 days from fruit set) are preferred for papain extraction. Tapping of fruits can be done early in the morning by giving longitudinal skin-depth incisions (0.3cm) on the surface of the fruits from the stalk end to tip. Stainless steel blades or knives or bamboo splinters are used for incising papaya fruits. The milky latex is collected in arecanut spathes or aluminium or glass vessels. The incisions are repeated in two or three subsequent occasions at 3 to 4 days intervals. The latex collected in this way is dried in the sun or in an artificial drier at 50-55°C. A small quantity of potassium metabisulphite is added to the liquid latex to extend the storage life of papain. The dried latex can be stored in airtight polythene or glass containers for a period of six months. Tapped fruits are equally tasty as untapped fruits, although impaired in appearance.